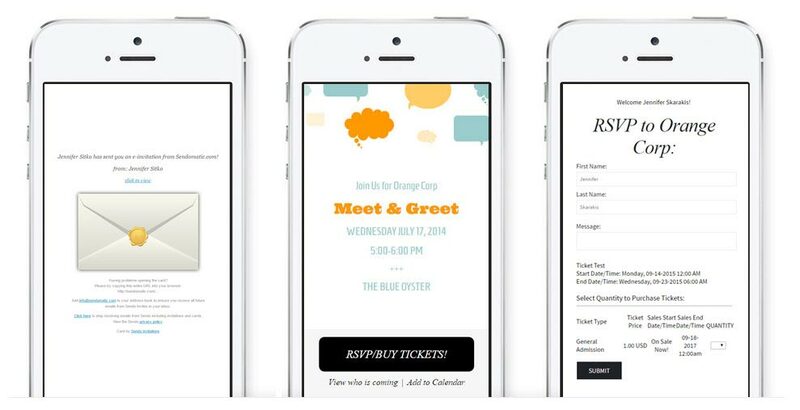 Send text message SMS invitations to your guest's phones - track RSVP's, view responses and sell event tickets. Sendo takes event management to the next level. Sendo provides text message and email invitation software to help individuals and companies: Save time, lower costs, increase responses and attendance, build-brands and maximize ROI for events. With Sendo, there are many way to get in front of your customer - Send your event to your guests via SMS text message, email, post on Facebook, Twitter or other social channels. Set up and sell event tickets or accept donations online in minutes. Allow your guests to print tickets with QR barcodes and manage event registration easily. Funds deposited instantly to your account. Accept all major credit cards and currencies. Sendo Invitations is advertisement free for you and your guests - no advertising on your invitation or in any communication to your guests. Manage responses in one location, send reminders, export all your data to a CSV file, notifications of invalid email addresses, see who has viewed and track response rates, get email or SMS alerts of new responses. Invitations right to your guest's phones. It's easy to reach your guests through text message or email invitations. Go ahead take Sendo for a spin - Only takes 5 minutes to create & send invitations!